According to the Georgia Secretary of State Elections Division, voter registration statistics as of October 1, 2014 show that 92,000 Latinos are registered to vote statewide. Overall, Latinos make up only 1.8% of the state’s 5.1 million registered voters. The majority of voters in Georgia are white—there are 3 million white registered voters, representing 58.1% of all registered voters in Georgia. Additionally, three-in-ten registered voters in Georgia are black, with about 1.5 million voters statewide. Asians represent a slightly smaller share of registered voters than Hispanics, with 71,000 registered statewide (1.4% of all registered voters in Georgia). The number of Latinos registered to vote has tripled since 2004: It rose from 34,000 during the 2004 presidential election to 111,000 during the 2012 presidential election and now stands at 92,000. Their share of registered voters in Georgia has also risen since 2004, from just 0.7% in 2004 to 1.8% today. In 2004, whites made up more than two-thirds of all registered voters in Georgia (68%). That share has been dropping, and whites now make up fewer than six-in-ten of all registered voters in Georgia (58%). The Hispanic population in Georgia is the 10th largest in the nation. About 903,000 Hispanics reside in Georgia, 1.7% of all Hispanics in the United States. Georgia’s population is 9% Hispanic, ranking 24th in Hispanic statewide population share nationally. There are 274,000 Hispanic eligible voters in Georgia—the 14th largest Hispanic statewide eligible voter population nationally. California ranks first with 6.4 million. Some 4% of Georgia eligible voters are Hispanic, ranking 29th in Hispanic statewide eligible voter share nationally. New Mexico ranks first with 40%. 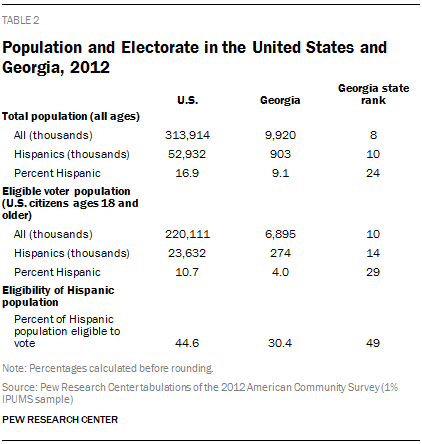 Some three-in-ten Hispanics in Georgia are eligible to vote, ranking Georgia 49th nationwide in the share of the Hispanic population that is eligible to vote. By contrast, 78% of the state’s white population is eligible to vote. Age. Nearly four-in-ten Hispanic eligible voters in Georgia (37%) are ages 18 to 29, greater than the share of all Latino eligible voters nationwide (33%) and the share of all Georgia eligible voters and of all U.S. eligible voters (both 22%) in that age range. Citizenship and Nativity. 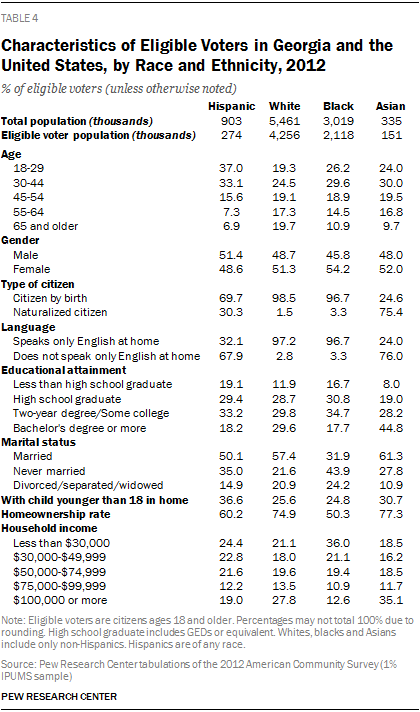 Among Hispanic eligible voters in Georgia, 30% are naturalized U.S. citizens, greater than the 25% of Hispanic eligible voters in the U.S. Just 5% of all eligible voters in Georgia and 8% of eligible voters in the U.S overall are naturalized U.S. citizens. Hispanic Origin. Hispanic eligible voters in Georgia have a different Hispanic origin profile from Hispanic eligible voters nationwide. About four-in-ten (43%) Hispanic eligible voters in Georgia are of Mexican origin, 22% are of Puerto Rican origin, and 35% claim other Hispanic origin. Among all Hispanic eligible voters nationwide, 59% are Mexican, 14% are Puerto Rican, and 27% are of some other Hispanic origin. Educational Attainment. Two-in-ten Latino eligible voters in Georgia (19%) have not completed high school, higher than the 14% of all Georgia eligible voters who have not completed high school and less than the 23% of Hispanics nationwide who have not completed high school. Homeownership. Six-in-ten Hispanic eligible voters in Georgia live in owner-occupied homes. Greater shares of all eligible voters in Georgia and all eligible voters nationwide (67% of each) live in owner-occupied homes. 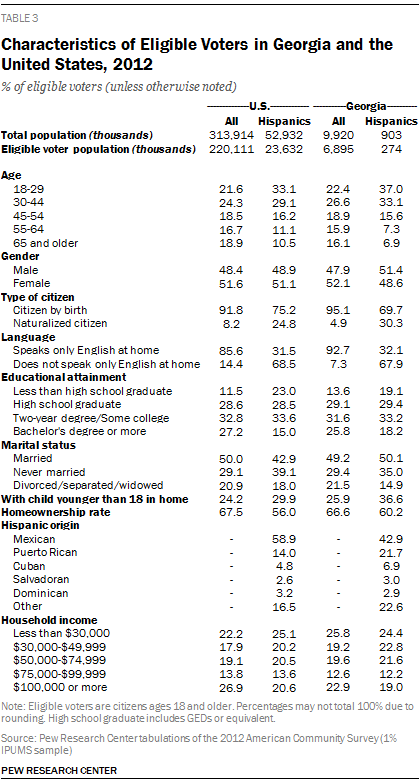 Hispanic eligible voters in Georgia are somewhat more likely than all Hispanic eligible voters nationwide to live in an owner-occupied home (56%). Number of Eligible Voters. White eligible voters outnumber Hispanic eligible voters in Georgia by nearly 16 to 1, and black eligible voters outnumber Hispanics by about 8 to 1. There are nearly three times as many Hispanic eligible voters (274,000) than Asian eligible voters (151,000). Age. 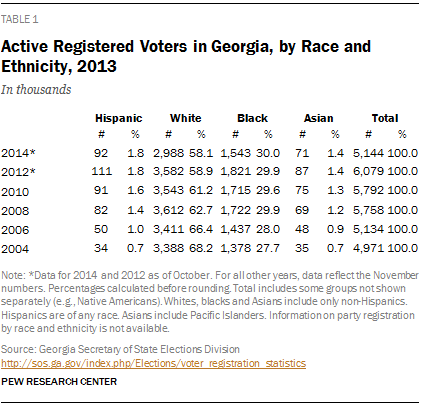 Latino eligible voters are younger than white, black and Asian eligible voters in Georgia. Some 37% of Latinos are ages 18 to 29, compared with 19% of white, 26% of black and 24% of Asian eligible voters. Educational Attainment. Hispanic eligible voters have lower levels of high school education than white, black and Asian eligible voters in Georgia. Some 19% of Hispanic eligible voters have not graduated from high school, compared with 12% of white, 17% of black and 8% of Asian eligible voters. Hispanics and blacks are equally likely to have at least a bachelor’s degree (18%, compared with 30% among whites and 45% among Asians). Homeownership. Hispanic eligible voters (60%) are more likely to than black eligible voters (50%), but they are less likely than white (75%) or Asian (77%) eligible voters to live in owner-occupied homes in Georgia.